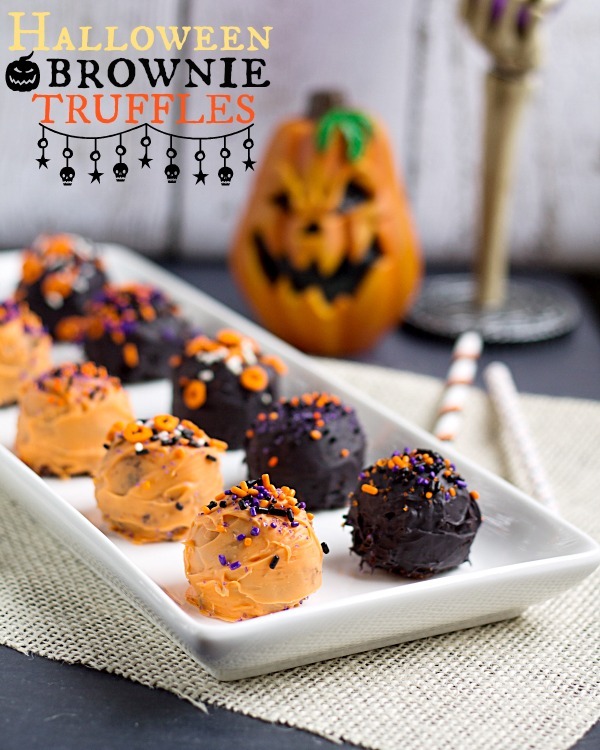 Please your guests at your next Halloween gathering with these Halloween Brownie Truffles. Brownies are dipped in vanilla candy melts and topped with fun, spooky sprinkles! I know, I know. You’re probably thinking to yourself “isn’t it a little early for Halloween?” Of course not! Especially considering it’s my favorite holiday! Plus, people love to plan their Halloween parties ahead of time. So here’s a fabulous little treat that your guests will love. Because who doesn’t love brownies?! Before we get to the recipe I’m going to tell you about my week. It’s been crazy busy. I feel like I’ve been neglecting the blog. And I have been to an extent. I only linked up to one party this week. I haven’t gotten around to responding to many comments and this recipe will only be the second one that I post this week. You can thank school for that. School and the blog conference/mini vacation to Orlando that Ken and I will be having this weekend. I have a ton of work for school and I want to finish it before Friday since we are leaving Friday afternoon. How has your week been? I hope it’s calmer than my week! Truffles. The first time I made them was when I made these. I’ll admit, they were quite a pain in the a$$ to make. I attribute some of that to being a novice in the world of truffle making. I attribute the other part to the candy melts. After melting them, they were still sorta thick which made dipping the brownie balls quite difficult. Can you say brownie crumbs in the candy melts? Yea, that’s what happened. So I ended up using a knife and “frosting” these truffles. It was a little time consuming so I only made 10 of these. Oh if only I had more time to spend on them. They are SO good! And they’re super cute and fun, aren’t they? You can pick up the candy melts and the sprinkles at Michael’s craft store. I just love that place. There are so many fun little baking ideas and accessories there. Do you have any tips and/or tricks for truffle making? I’d like to give it a shot again sometime. Any help that will make the process smoother is greatly appreciated! 2 12oz bags of candy melts in your choice of colors. I went with orange and black. Prepare the brownies according to package directions. After baking, cool completely. I baked mine the day before I made the truffles. Once the brownies are cooled, break them up until they are crumbly. Line a baking sheet with parchment paper. Shape the brownie crumbles into balls. I used a cookie dough scoop to scoop and press the mixture. Then, using my hands, I patted them into a rounder shape. Melt the candy melts according to package direction. If your candy melts get thin enough, then you should be able to dip the brownie balls into the melts and then remove them and place them back onto the parchment lined baking sheet. If your candy melts are too thick, you can do what I did - I used a knife to "ice" the brownie balls. My melts were the consistency of store bought icing so using the method I did worked perfect. It was just a tad bit time consuming. After coating each brownie truffle, top with sprinkles. Place in the refrigerator for 30 minutes to allow the coating to harden. You’ve done some work on your site! Everything looks great and it loads FAST! But besides all that I LOVE Halloween! It is my favorite favorite! I am like chomping at the bit to decorate. These truffles are awesome Julie! You did a great job on these truffles Julie! They look great! Thank you, Nicole! They were a pain to make but I love the way they turned out! These look festive and fun! I’ve had good luck dipping brownie and cake balls/truffles if I freeze the balls for a little while (20-30 minutes) before I dip them. Don’t leave them in the freezer so long that they actually freeze then defrost and the moisture messes up the chocolate layer, but just long enough that crumbs are less likely to fall off. Thank you, Holly! I’ll have to try freezing the truffles before dipping them next time! Thank you, Claire! And thank you so much for the tip! Thank you, Anne! Haha, all of the people on the cooking shows make it look so easy to do everything! I want to try truffles again one day. I am going to get some tips from others so I can have a smoother experience next time. Hope you enjoy your weekend! Mine is starting early this week! Too early for Halloween?? Shoot, I was ready for Halloween on September 1st! It’s my favorite holiday, and these look like an awesome treat to commemorate it with. Thank you so much! I feel the same way. I am ready for Halloween well before Halloween. It’s such a neglected holiday. The stores basically jump right over it and dive into Christmas! Thanks so much for stopping by! I’ve been debating when to start baking some Halloween themed goodies, I’ve plenty of idea’s floating around in my head that I’m itching to get started on. The truffles look lovely. Thank you, Laura! You should definitely start! These are beyond cute, Julie! I love the graphic too. Beautiful job! Yum! Julie they turned out so cute! I have to agree with you, Julie…Halloween, I think has to be my most favorite holiday…besides my bday, of course! Halloween parties start early every year, too. I was actually wanting to hire a (real) Medium over to join my party with all the guests…but my Justin says that he doesn’t want everyone else’s spirits hanging around when the guests leave. So, I’m still working on planning my party…we’ll just have to see! But these treats would have to be a must. And, everyone loves brownies. Besides, they’re bite-size…winner! Pinning! You can add gulf wax to almond bark, candy melts or chip pieces it makes it thinner easy to work with. Thank you for the tip, Brenda! Sounds delicious to me…and they are super cute. These are so cute! 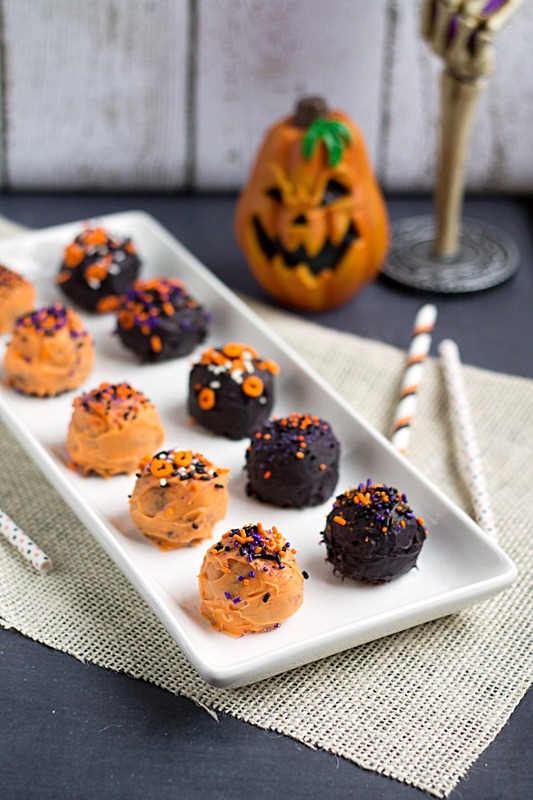 My daughter loves helping me make cake pops, and this is a perfect project for Halloween! Hi Julie! I just love your photo and these sound so yummy! Thanks for sharing them and joining us at Best of the Weekend! Of course, pinning and sharing on FB and Twitter! :) I’ve been making candy for, well, longer than I want to admit! There’s a product called Paramount Crystals, which can be added to candy melts to bring them to a dipping/pouring consistency and doesn’t change the flavor. Also, try CandiQuick – it’s my new favorite! Melts smoothly and perfectly in the microwave and tastes so much better! It can be flavored with candy oils or colored, too. I think you’ll like it! Have a great Sunday! These are so cute! I love this idea! Sounds totally delicious. 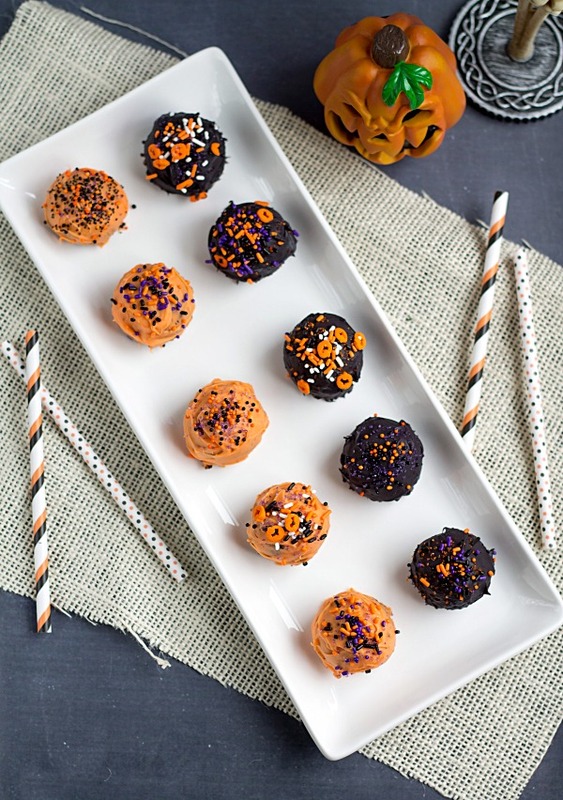 These truffles will be a hit when it hits the halloween buffet table in my child’s class. You page looks really nice. LOVE this dessert idea! I’ll bet you could use a melon baller or small ice cream scoop to make the truffles instead of crumbling & reshaping them. Oh I used a mellon baller after crumbling them so I could shape them! But they were flat on the bottom so I had to do a little reshaping after using the mellon baller! But my suggestion would be to use quality melting chocolate (Chocoa is top-notch), white chocolate that you would just add orange coloring to and milk or dark chocolate. Once the truffles are balled up throw them in the freezer for maybe 30 minutes – 1 hour max is all you need. Then melt the chocolate and dip. Super easy and the chocolate will harden quickly around the cold truffles then keep them out to get back to room temp before serving. Thank you so much for the tips! I’ll definitely have to use some of your ideas the next time I make truffles. While these were a little difficult to make, I am determined to make an easy batch of truffles! Pinning these truffles, can’t wait to share and enjoy them!